This 1933 postcard features the Chestnut Avenue entrance shortly after Northwood Hills station was opened. The first signs of the rapid housing development that followed appear on the horizon. 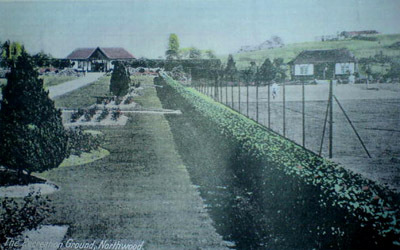 It was not until 1937 that the council was able to announce the construction of a pavilion and the provision of two cricket pitches to serve the new residents. What was once our 'back' pitch was used between the wars by a team representing the Central Club in Hallowell Road on Saturdays and Northwood British Legion on Sundays. In 1947 these two clubs combined to form Central Northwood CC who eventually became one of the founder members of Northwood Town CC. They are remembered by the feathers on our badge. The story has it that on one occasion a player having produced a good performance was awarded with someone placing a feather behind his brooch type cap badge. In 1913 the Ruislip & Northwood Urban District Council became the first local authority to publish a Town Planning Scheme that proposed to set aside nearly 1500 acres for recreational use. Doubtless this included Northwood Recreation Ground which at the time was divided between two landowners whose boundary fence exists in part today alongside the football ground leading up to Haste Hill. The area towards Northwood Hills was owned by Arthur Helsham-Jones - a speculator from Wooton Hill in Hampshire who had acquired several local farms. The next developer to be attracted to the area was H.E. (Harry) Peachey who came down south with his business partner Mr Belton. One of their first objectives was to persuade railway companies (Met and LNER) to construct a new station in Joel Street. Harry Peachey was clearly a cricket enthusiast. After making his home in Briarwood Drive, he founded Northwood Hills Cricket Club in 1937. It is not certain how much cricket was possible during the war years. It is assumed that the average age of the one team fielded rose somewhat. Another feature to contend with was a barrier of iron posts embedded in concrete designed to prevent enemy aircraft landing in the event of an invasion. Once the threat was removed the posts were sheared off but the bases remain, now buried beneath the surface. NHCC regained their numbers by 1952 enabling 1st and 2nd XIs to be fielded both days. A team picture from that year can be seen on the left. 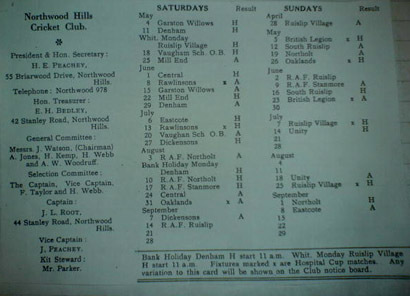 They arguably achieved their best playing results in the late 50's - early 60's when their fixture list included many sides now gracing Division 1 of the Hertfordshire Leagues. Although Central Northwood CC had been able to effect some improvements to their pavilion, the new club elected to operate from the main building. Luckily there were enough changing rooms to accommodate four teams. A new committee was drawn up from members of both sides and teams selected on merit. The previously arranged fixtures were to be honoured resulting in three Saturday XIs and four Sunday XIs taking to the field at the height of the season.. The 1974 season saw a reduction in the list to two Saturday XIs and three Sunday XIs. The Cricket Club Conference was once strictly for amateur non-league clubs. When they finally amended their rules, many small leagues were founded amongst clubs having enjoyed regular fixtures and good relations between each other over the years. In some respects this lead to a 'closed shop' policy and a disturbing fragmentation throughout the county. One of these leagues was the Middlesex Cricket Alliance, a nine club group where Northwood Town were elected to replace Hayes in 1976. In the meantime an organisation known as the Association of Middlesex Cricket Clubs had been formed with the aim of providing a graded league system based on a points assessment of playing strength, pitch and general ground amenities, with divisions for second and third elevens. Before a ball had been bowled, as far as Town were concerned, the Alliance had amalgamated with the new Middlesex Cricketers League as it was to be known. They had graded eleven of their clubs as senior including Harrow Town, Hatch End and Hillingdon together with the nine Alliance clubs. The Alliance would operate as a separate division during the first season before the top halves of both groups combined to form a senior division during the second season. The remainder would constitute a second division. Unfortunately Town took the wooden spoon in both 1st and 2nd XI divisions but maintained respectable mid-table positions in division 2 thereafter. 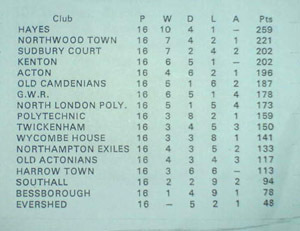 The 3rd XI gained a worthy runner’s up spot in 1982. By the 1990s, Northwood Town CC were fielding two teams in the Hertfordshire Cricket League on Saturdays, along with an occasional 3rd XI that played friendly fixtures. Sunday cricket involved two sides in the Chess Valley League, although this was reduced to the solitary side in the new Millennium.